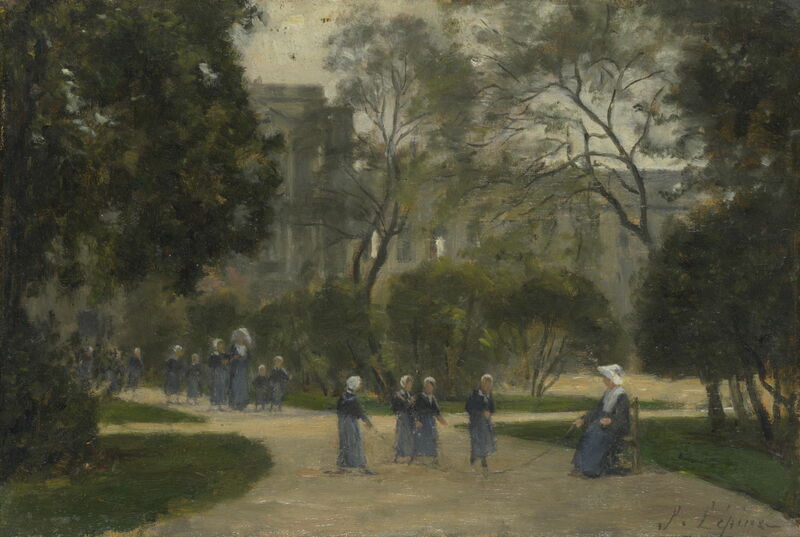 Stanislas Lépine (1835–1892), Nuns and Schoolgirls in the Tuileries Gardens, Paris (1871-3), oil on panel, 15.7 x 23.7 cm, The National Gallery, London. Courtesy of National Gallery (CC), via Wikimedia Commons. On 15 April 1874, in the empty studio of the photographer Nadar, on the second floor of a building on the Rue Daunou (its address normally given as 35 Boulevard des Capucines), in the heart of Paris, thirty artists exhibited their works at what is now known as the First Impressionist Exhibition. One was absent: Frédéric Bazille had been killed in the Franco-Prussian War in 1870. Of the thirty, seven achieved fame to the point where some are almost household names. Claude Monet, who showed 12 works, is now by far the most famous. Pierre-Auguste Renoir (7 works), Edgar Degas (10), Camille Pissarro (5), Paul Cézanne (3), Berthe Morisot (9), and even Alfred Sisley (5) are widely known, their works sought after by collectors around the world. Several could have been represented: key figures in Impressionism such as Jongkind and Manet were absent, but there was an impressive total of 165 works from thirty artists in all. That leaves some 111 works, mainly paintings, by 23 artists, unaccounted for. The aim of this new series of articles is to try to discover more about these ‘vanished’ Impressionists, whose paintings were good enough to hang beside Monet’s in 1874, but who have been lost from the history of art. Zacharie Astruc was an occasional painter and sculptor who became an influential critic, who provided the Impressionists with valuable support in the press. Eugène Boudin was an established landscape painter who persuaded Monet to become an artist, and taught him how to paint en plein air. Armand Guillaumin went on to exhibit at five more of the Impressionist exhibitions, and achieved modest success as an Impressionist painter, but has since been largely forgotten. Stanislas Lépine continued to paint landscapes, and particularly views of the Seine, but never really became properly impressionist. Henri Rouart was an engineer and amateur painter, a friend of Degas, who went on to become a successful industrialist and avid collector of Impressionist art. I hope that you will join me in discovering more about these vanished Impressionists in the coming articles. Rewald J (1973) The History of Impressionism, 4th edn, The Museum of Modern Art, New York. ISBN 0 87070 369 2. Posted in General, Painting and tagged exhibition, Impressionism, painting, unknown, vanished. Bookmark the permalink.